← Thirty home runs used to mean something. It still should. The Orioles came tantalizingly close to sweeping the New York Yankees this week. It would have been the Birds’ first three-game sweep in New York since 1986 when they shut down the Yanks in a series from June 6th through 8th. 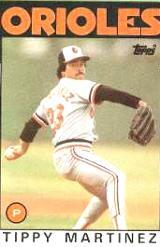 Scott McGregor, Mike Boddicker, and Ken Dixon picked up the wins for Baltimore that weekend in a trio of games the O’s won by scores of 5-2, 7-5, and 18-9, respectively. Don Aase earned the first two saves of the series while Tippy Martinez finished the sweep with the last of his 115 career saves, his only one during the 1986 season. Sunday’s wild finale in 1986 may as well have been Old Timers Day at the ballpark. The 36-year-old and soon-to-retire Martinez pitched 3.1 innings, allowed three runs on six hits, struck out two, and walked one. His line was better than that of 43-year-old Tommy John, who went three innings, allowed four runs on seven hits, and recorded no strikeouts or walks. Both pitchers entered the game due to unique circumstances. Martinez was Weaver’s only rested relief option when he came into the game with the bases loaded and two outs in the sixth. Weaver was limited to eight available pitchers for the weekend series due to Mike Flanagan’s trip to the disabled list and Nate Snell’s bruised foot that kept him back in Baltimore. Tippy wasn’t particularly stressed about the prospect of impressing his manager and ending the O’s meltdown. The lefty promptly struck out Yankees third baseman Mike Pagliarulo, who homered the previous night, to stifle a New York rally that closed a 7-1 gap to one run. Former Oriole Gary Roenicke drew a bases loaded walk earlier in the Yankees’ five-run sixth inning. The offense provided Martinez an extra seven runs of insurance to work with in the top of the seventh inning. All of the runs came at the expense of 23-year-old Yankees rookie, and future Oriole, Doug Drabek. The O’s bullpen had been key to the team’s success during a 20-6 run they enjoyed prior to the Sunday finale. The group posted a 7-0 record with 11 saves and a 1.66 ERA. Aase, who had spent nearly two full seasons on the disabled list following reconstructive elbow surgery in 1982, led the bullpen charge as he worked toward a career-high 34 saves and his lone All Star appearance in 1986. One night earlier he made his 25th appearance of the season and earned his 16th save. Tommy John took the loss on Saturday after giving up six runs – three of them earned – in four innings of work. He then became the fifth Yankees pitcher on Sunday when he appeared in relief of Al Holland, who pulled a hamstring after tossing five pitches to Lynn. After two fleet contests that each ended in well under three hours, Sunday’s series finale turned out to be the longest-nine inning game in American League history. The game lasted four hours and sixteen minutes, not including a 40-minute rain delay along the way. The total topped the previous longest game by five minutes. Lee Lacy made sure that didn’t happen. Lacy, who emphasized after the game that he was a “line-drive hitter,” ripped three home runs, the third of which caused Rick Dempsey to feign fainting in the dugout. Larry Sheets added a blast into the black center field bleachers at Yankee Stadium on what was in fact Bat Day in the Bronx. Overall, the Birds totaled 22 hits. The sweep was the Orioles’ first against the Yankees since Aug. 8-10, 1980, and put some early distance between the second-place Birds and the third-place Yankees. Not that Weaver was doing any celebrating. Perhaps Weaver knew what was coming. Baltimore finished the 1986 season in last place in the seven-team American League East with a 73-89 record, 22.5 games behind the first-place Red Sox. The 90-win Yankees finished in second-place by 5.5 games. This entry was posted in Flashback Friday, Orioles history and tagged Flashback Friday, Orioles History, Yankees. Bookmark the permalink.